Th-INK-ing of You: A Blinged Up Snowy Blast! Anyway, I got up this morning eager to do some stamping and then a neighbor needed a ride to town... so I'm off to a late start, but I made this card for today's Sketch Challenge on SCS. Anne (jdmommy) had originally inspired Roxi's choice and I just had a blast with it! The image is Impression Obsession and is stamped with Memento onto Neenah CS and colored with Copics. I masked the scene and sponged the sky with Bordering Blue and Brocade Blue, then some Memento London Fog. The base of the card is SU! Kraft (thanks again to Dawn). The designer paper is The Paper Studio and the blue is Bazzill Textured. I used my Cuttlebug Swiss Dot EF and added Fun Flock to the pom poms. There are Dazzling Diamonds on the snow lines. The pearl flourishes are from ZVA and will soon be available from Our Daily Bread designs Store. I added some blingy snowflakes from my stash. Hope you enjoyed this wintry blast! I have a passion for snowmen and just hope we get a little snow here so I can go play in it!!! LOL! If you'd like a little spiritual inspiration, please visit Women to Women. My devotional is up this week and I'd love to have you visit! AWWW Grace this is such an adorable image...LOVE your take on the sketch!!!!! LOVE LOVE the added bling! This is so sweet. I love the image. I haven't seen this one before. I thought I had seen all snowmen stamps..HAHA. I love this sketch. It is a fun one. 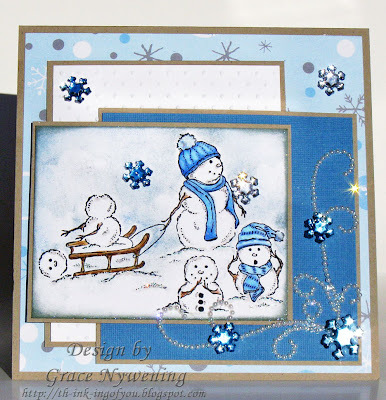 Your bling is perfect for a snowy card.. Not sure I want any snow but I love my snowpeople. I bet your house is quiet..Hugs. This is totally cute. Great color choice. Oh Grace, this is just way to cute!! Love the pearl flourished accent in the corner...just perfect!! This is gorgeous and cute all rolled into one Grace!! I love your snowman scene, the pearl flourish, the blue snowflakes, and your background. Great coloring and take on the sketch my friend!! What a super card. Love the sponged sky effect and all that gorgeous bling.